“Thanks a Million” – Conservation and Renewal Project – Roof Building Work Phase 1 As you may already know, we have a Church roof that leaks. 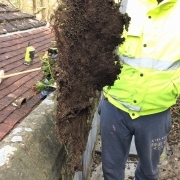 You will be pleased to know that over the coming months work will be undertaken to carry out some urgent roof repairs and to carry out some much needed maintenance. The work is due to start in March and finish in late June. Part of this work is being funded by a ‘Listed Places of Worship’ grant and the rest from our Fabric fund and from loans we have had to take out. 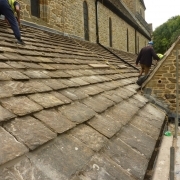 The roofing work will be carried out by DBR Ltd (a leading stone conservation company, who have carried out work on places such as Chichester Cathedral, Hampton Court Palace and Nelson’s Column). If you would like to make a donation to the “Thanks a Million” Conservation and Building project, please speak to one of the Churchwardens or visit see the links above for more information. Do you or a relative work for a large company or corporation that supports staff through charity activity match funding? As part of our Thanks A Million campaign St Mary’s wants to explore how businesses can support our efforts. We are asking members of the congregation to find out whether their companies have a policy of supporting staff in charitable fundraising activities (some may even offer match-funding for example). Please let the Vicar Guy or the church office know details and he will collate the information. 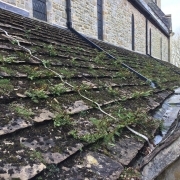 During the summer of 2017, as part of our Conservation and Renewal project, we undertook urgent roof repairs and some roof maintenance work to the Church. We were very fortunate that with the grants we received we were able to undertake not only what we had planned for Phase 1, but also a significant part of the Phase 3 work as well. During the early part of 2018 plans have been progressing to move forward with some of the Phase 2 objectives which focus on the interior of the Church building. Over the next few months work will be undertaken to carry out urgent repairs to the Tower stairs and the ringing chamber. One of our stained glass windows on the South side of the Church which has been letting in a draught for quite some time is to be repaired. This work will be undertaken by Cliff Durant who carries out stained glass restoration work and is based in Horsham. For a long time the draught caused by the North Porch door has left many people in our Church feeling rather cold during the winter months. We are having a Hot Air Curtain installed over the North door which should keep us a bit warmer this winter. Earlier this year we appointed J. D. Clarke Architects (Eastbourne) to start preparing plans to re-order the South Aisle. The project is to open up an accessible area that can provide a flexible worship area along with space for serving refreshments. We are at an early stage with this project but we hope to have some concept design ideas ready soon. The Church Centre renewal project is progressing well. Again we are using the architectural services of J. D. Clarke Architects to design and manage the project. The aims of the project are to improve the reception area, the kitchen, the Barn hall, thus enhancing the overall facilities, and providing suitable accommodation to enable us to relocate our St. Mary’s Pre-school to the building. With the improvements, which will be up to date and fit for purpose, we hope to be able to generate more income to support the mission of our Church. We have had many meetings to discuss our initial thoughts and view outline proposals. We are hoping that over the coming months we will be able to share our exciting proposals with everyone. Watch this space! All of these exciting plans are going to cost us both in time and hard cash. Do please think about ways in which you might help us to fulfil our vision of renewal for the mission of St. Mary’s Church in Horsham over the coming years and into the future.